The Integrated Care Network (ICN) is a three-way partnership between Groundswell and specialist GP surgeries Great Chapel Street Medical Centre and The Dr Hickey Surgery in Westminster. Over the past seven years the number of recorded visits to A&E departments across England by people with no fixed address has increased by 65%, last year nearly 32,000 patient visits of this nature were recorded. Last year this patient group cost the NHS over £4.7million. 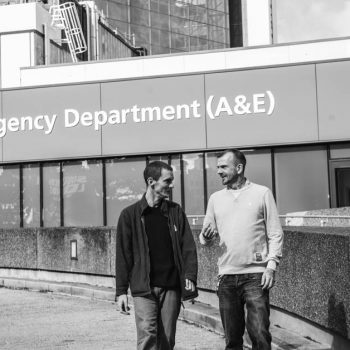 The ICN aims to reduce A&E attendances and admissions to hospital by people who are experiencing homelessness. To achieve this the ICN works to increase patient’s engagement with primary health services, reducing the need for secondary care. This is led by David, Groundswell’s ICN Care Navigator who helps targeted patients from Great Chapel Street Medical Centre and The Dr Hickey Surgery navigate their healthcare. David manages a caseload of homeless patients from the two GP practices; both rough sleepers or those in some form of temporary accommodation. These are people who typically have very poor health and require frequent and intense engagement with healthcare. David, with support from Groundswell’s volunteer peer advocates, supports the patients to navigate their health appointments and overcome barriers to access. These barriers include paying for travel to attend appointments (e.g. bus or a taxi if have a physical disability), ensuring they have food or drink, sending text or call reminders of appointment details and providing moral support and companionship if someone is particularly anxious. Between March 2018 and February 2019 77 patients have been supported through the ICN caseload. David manages four ICN respite beds in two Westminster hostels. The beds work alongside David’s caseload to reduce the risk of avoidable visits to A&E and stays in hospital; patients stay for up to six weeks and receive intensive support to navigate their appointments. Between March 2018 – February 2019 29 patients were placed in ICN beds staying for 29 days on average. By preventing hospital admissions this saved the NHS around £60,000. 90% of the patients referred to ICN in the past year feel like they are in better health and are better able to cope. If you know someone who may benefit from being referred to the Westminster ICN project please download the ICN referral form by clicking here. The form also outlines the referral criteria and gives David’s contact details.